Size: 40 mm in diameter. 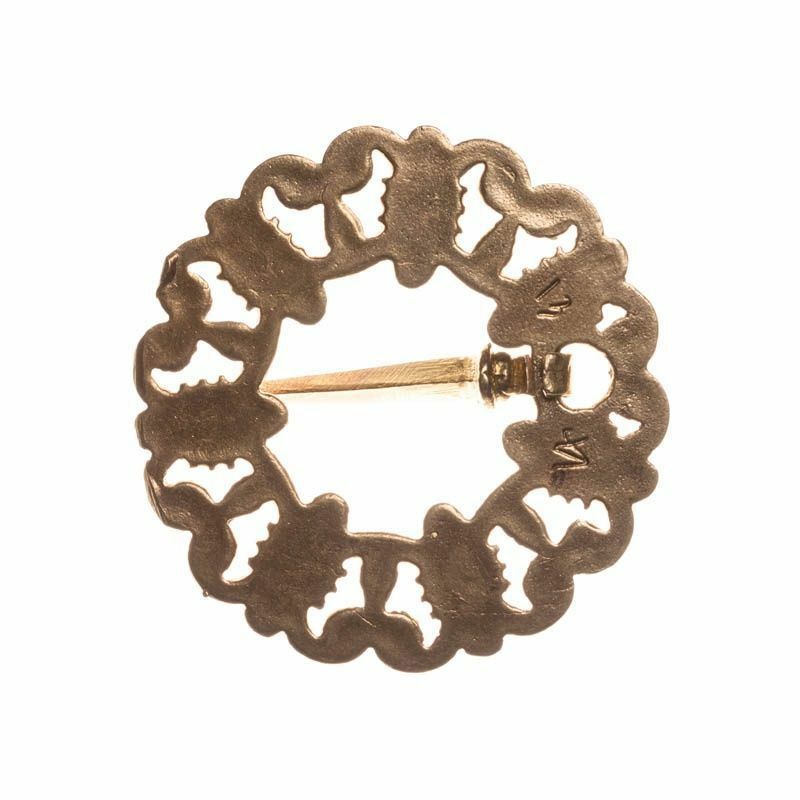 Brooch is perfect for fastening of tunics, headwears and dresses. Casted bronze clasp for a cloak or dress fastening, consists of two parts. There is lady's figure in center, and floral branches enclosed with circles. Size: 55 x 30 mm Dated: 1400s - 1500s AD .. This model of medieval brooch is based on the painting "The Head of a Woman" (Geertgen tot Sint Jons) It is decorated with aqua chalcedony. .. Cast bronze brooch is decorated with pearls and green onyx. There is an amazing attire for any woman’s medeival dress. Model of this medieval brooch is based on the painting of Dutch master Petrus Christius "A Goldsmith in his Shop" (1449 year). It is kept in Metropolitan Museum now. In category “Brooches and fasteners”, you may find more beautiful accessories for your medieval outfit. .. Medieval bronze fitting for clothing is referred to the XV century. This model is based on the painting of Meister der Georgslegende. Attire will be prefect for your medieval costume in Renaissance style. Size: 50*15 mm More fasteners are available in category “Brooches and fasteners”. .. This replica of medieval brooch is made of bronze and decorated with green onyx. We may see such attire on the painting of Flemish artist Geertgen tot Sint Jans. Brooch of the XV century will be perfect adornment for your dress of the late Middle Ages. Size: 30*30 mm More models are available in category “Brooches and fasteners”. ..
Handcrafted bronze pendant of the XIV-XV centuries will be perfect decoration for woman’s chain girdle. Rosettes inside the circle are typical Gothic-style ornaments. You may see similar accessory on the paintings of Flemish masters. Design of this bronze pendant is based on the historical archaeological findings. You may additionally adorn your belt with rectangular mounts of the same style. Size: 27*45 mm Please check out category “Cast belt sets” – there you may find many bronze fittings for belts, with which this pendant will compose perfect set for your medieval outfit. .. 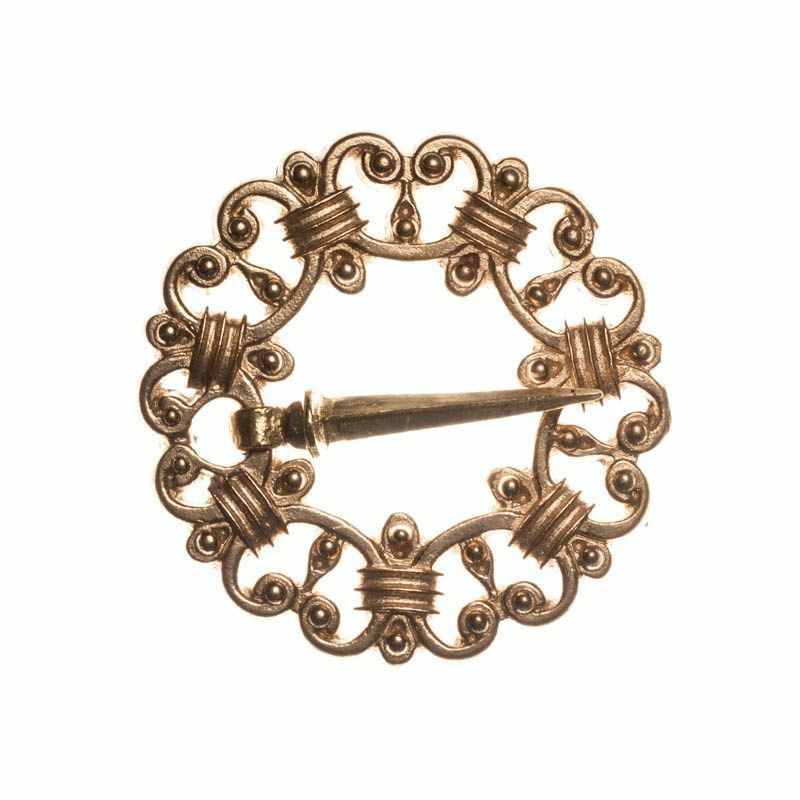 This beautiful ornamented fastener for cloaks and capes is handcrafted of top-quality bronze. Replica of medieval clasp from archaeological findings of the XIII-XV centuries. By your wish, we may decorate this clasp with enamel. Color of enamel is available in options. Diameter: 60 mm Bronze fastener will be perfect as for women’s, so for men’s medieval costume. More fibulas and clasps are available in category “Brooches and fasteners”. ..